No-fail, perfectly domed buttermilk cupcakes with a tender, buttery crumb, covered in 10-minute caramel icing that drips deliciously down the sides. If you don’t have buttermilk on hand, add 1 tablespoon of white vinegar or lemon juice to a measuring cup and add enough milk to measure 1 1/2 cups. Stir and let sit at room temperature for 10 minutes. Add the flour, cornstarch, baking powder, and salt to a bowl and stir with a wire whisk to combine. Put the butter and sugar in the bowl of an electric mixer and beat on medium-high speed for 5 minutes, until the mixture is light and fluffy. Scrape down the sides of the bowl and add 2 of the eggs. Beat on high until completely incorporate. Scrape down the sides of the bowl and add the other 2 eggs plus the egg yolk. Beat on high until the eggs are fully incorporate and the batter is perfectly smooth. Scrape down the sides of the bowl. Stir the vanilla into the buttermilk. Add the flour and buttermilk in alternating additions: 1/4 of the flour, 1/3 of the buttermilk, 1/4 of the flour, 1/3 of the buttermilk, 1/4 of the flour, the last of the buttermilk, and the last of the flour. After each addition, mix on low speed just long enough to barely incorporate. Stop to scrape down the sides of the bowl a time or two. After the last addition of flour, use a rubber spatula or wooden spoon to stir the batter, ensuring all the ingredients have been well combined. Bake for 5 minutes. Reduce the heat to 350 degrees and bake for 13-15 minutes longer, until a toothpick inserted in the center of one of the cupcakes comes out without any batter on it. Remove from the oven and place the pans on wire racks. Let cool for 5 – 10 minutes, then remove the cupcakes from the pan, set on the wire racks, and allow to cool completely before frosting. Add the butter, salt, and brown sugar to a medium size saucepan set over medium-high heat. Cook, stirring constantly, until the sugar is melted and the mixture is just starting to boil. Stir in the milk and bring back to a boil. Remove from the heat and stir in the powdered sugar and vanilla with a wire whisk until smooth. 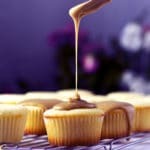 Pour the caramel frosting over the cupcakes while it’s still warm. If you only have one or two cupcake pans, bake the cupcakes in shifts. It can be useful to fill the cupcakes all at once so that you know you’re filling them evenly – just set extra paper liners on the counter top and distribute the batter evenly amongst all 30 cupcakes.